Jam Paddle Apalachicola & St. George Island! Grab your kayak and head to the coast April 5-7 and join in what organizers hope will be another world-record attempt to gather the largest number of kayaks together in one floating mass to break the current Guiness world record. 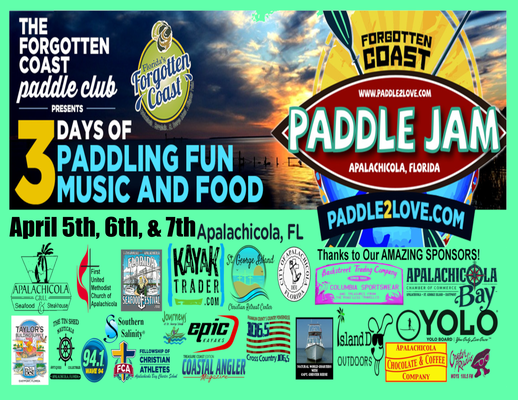 The three-day Forgotten Coast Paddle Jam event is sponsored by the Forgotten Coast Paddle Club. The Guiness World record attempt is just one activity planned as part of the area-wide fund-raising event featuring races, games, raffles, music and food. I am a Florida building contractor for 38 years and I still love what I do. I designed and built my island house in 2003 and love the beach, boating, fishing and the local area.